14 Freezing Homeless Cats... woman evicted and forced to place cats outside in straw tents... help is desperately needed! 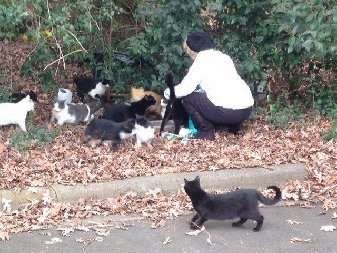 DEC 5 *From Saundra: Hi all: This is a colony of tame cats in Charlotte that are sweet and beautiful. I have been working to keep them fed in wet food since the lady in a 2 bedroom apartment got evicted and put them in straw tents behind the apartment and the cats keep trying to go back into to. The apartments are not Cat friendly and a picking them off, if you know what I mean. Many of them are long-haired and adoptable. I have been s/ning them as I can.......approx. 20 cats. If any rescue want to adopt out the tame ones, great! There are a few older ones that might need to be euthanized? they are living on a small strip of land behind the apartment backed up to a parking lot where I am feeding them. 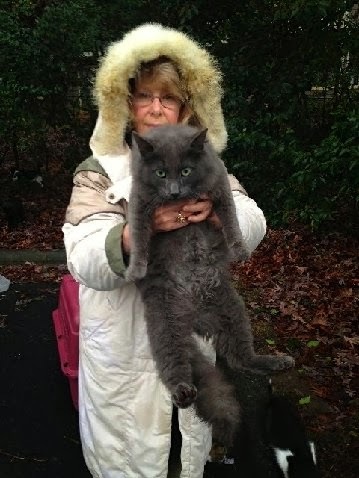 DEC 6 *From Melba: You are probably aware of the situation in South Charlotte where a lady was evicted, along with her 20 cats. Many of them are spay/neutered and current on shots. Many are beautiful, tame and long haired. There are numerous 3 month old kittens. They are living outside with some straw huts the lady erected. I'm trying to find out more. These kitties are cold, wet and suffering out there. My heart is heavy as I am only one person. I'm very overloaded and have had 3 horrible emergencies this weekend that have literally consumed every moment. I have not been off the computer except to sleep and that I was unable to do because of worry. I know I cannot save every cat. But, I try to do whatever I can. I'm trying to decide whether to withdraw on this situation immediately, while I still can. OR, if you ladies will commit to the project of finding rescues/homes for them along with me. I cannot do this alone. I have a couple foster homes that will take cats. I have another lady who runs a petsitting business and has a doggie day care that has offered a bedroom in her home. If I take any cats into a foster, I will be stuck having to do all the work for vetting and finding homes. This would be no small task. As of right now, I have places where possibly 8 cats could go! BUT, I CANNOT DO IT ALONE. So, I'm asking if you are willing and can dedicate time to being a team on this project. Each person take a couple cats, focus on getting whatever they need and adopted out. I have sponsors and can raise more money if necessary, which I am good at. Money is not the issue. Please take some time to consider this request. Honestly, if you do not wish to participate, there are no hard feelings. This is so disturbing as are many other situations in our community and state. It takes a village. Here are a couple photos of kitties in need. Thanks for your consideration . Please cross post to folks who will help. UPDATE: MELBA SAID SHE DID FIND SOMEONE TO HELP GET THE SMALL DOGHOUSES FOR TONIGHT. SO GOOD ON THAT NOW. ALSO PER BELOW HAVE ABOUT 6 CATS WITH OFFERS. THAT LEAVES 14 MORE CATS NEEDING HELP!